I wear clunky jewelry so I don’t bleed to death. Less than 100 days until the NYC Marathon! It’s coming up quickly. The last week of training was a bit of a mess—I ended up having some of the worst food poisoning of my life and my training was somewhat derailed. But the important thing is that I still managed to get in my long run on Friday morning. From everyone I’ve talked to, this is the weekly run that is absolutely essential to a successful race day. Life and work can sometimes mess up your plans to regularly run during the week, but the long run must happen no matter what. No excuses. With plans over the next few weekends, I’m trying to adjust my schedule to do my long run on Fridays before work. It’s definitely rough while I’m doing it, but it makes the entire weekend that much better once it’s out of the way! Although running is keeping me healthy and improving my leg, I’m also constantly running about in my life. My days are filled with work, friends, travel, etc. that always keep me on the go–but despite being busy, I am a strong proponent of taking precautions and being safe where you can. Because my deep vein thrombosis (DVT or blood clots) was so severe, I’ve been on a whole slew of medications to thin my blood. I’m currently taking xarelto (aka rivaroxaban—I’m a huge fan, and happy to discuss with anyone in more detail) and a baby aspirin daily. The xarelto is an anticoagulant (helps to lengthen the time it takes for my blood to clot) and the aspirin is an antiplatelet (helps to prevent my blood cells from clumping together to form a blood clot). In short, because the veins in my leg are so damaged, I am highly susceptible to developing another DVT. And as with all DVT, if a part of the clot breaks off and goes to my heart and lungs, I will develop a pulmonary embolism (PE). PEs can be instantly fatal because they can cut off blood flow into the lungs. I had several PEs when I was first diagnosed, but was lucky they were small and not fatal. Clearly this is not an acceptable risk. I therefore take blood thinners daily, and may well be on them for the rest of my life. But what are the risks? While the blood thinners help prevent future blood clots and help save my life, they also prevent my blood from clotting when I’m injured. It definitely doesn’t help that I’m a klutz, but I’ve stepped on glass and bled everywhere for close to an hour. I’ve walked into a door and given myself a concussion. I’ve bumped into tables and everyday objects and ended up with massive bruises. I’ve had bloody noses in dry weather that last a completely unreasonable amount of time. And for the most part, this isn’t a big deal. But it does mean I’m banned from a lot of physical activities. I’m not allowed to play contact sports. I’m never allowed to ski or snowboard. I’m still trying to figure out if I can SCUBA. And I’d be an idiot for playing paintball. Lucky for me, I’ve never been coordinated enough to do most sports—it’s another reason why running is so important to me. Running is no-contact and requires nothing more than putting one foot in front of the other. The greatest risk of being on blood thinners is mass trauma. What happens if I get hit by a car? Or something falls out of a window? Or I fall off a balcony? It’s in the freak accidents that there is the most danger. All of these are accidents that would endanger anyone, but in my case I will not stop bleeding. Unfortunately there is currently no known antidote for xarelto (some blood thinners, such as warfarin/coumadin have a known antidote, but require much more daily upkeep and effort). This may change soon, but for now the risk of uncontrollable bleeding is even more serious. It is therefore very important that should I get in an accident, the EMT or other healthcare professional immediately know my medications and condition. 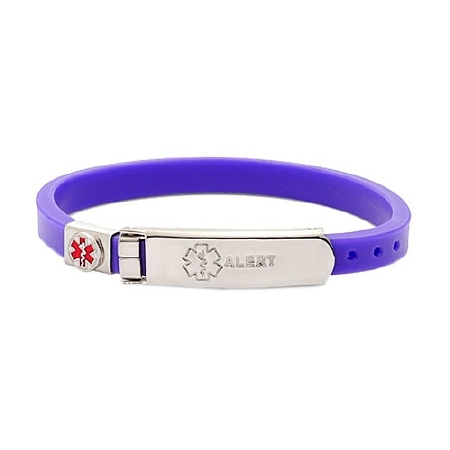 That’s why I wear a medical bracelet—it lists my name, conditions, medications and emergency contact. I wear it all the time and never take it off—going out, showering, exercising, etc. Odds are it will never be used, but there’s a peace of mind knowing that I’m prepared for the worst case scenario. You can buy the same bracelet here. I previously wore this medical bracelet, but was worried it wouldn’t catch a medical professional’s eye in an emergency. I had previously worn a nicer looking bracelet, but it looked too similar to the LIVESTRONG bracelets that so many people wear variations of today, and a former EMT friend of mine let me know that he would not recognize it to be a medical alert bracelet. I got both my bracelets at Walgreens.com. 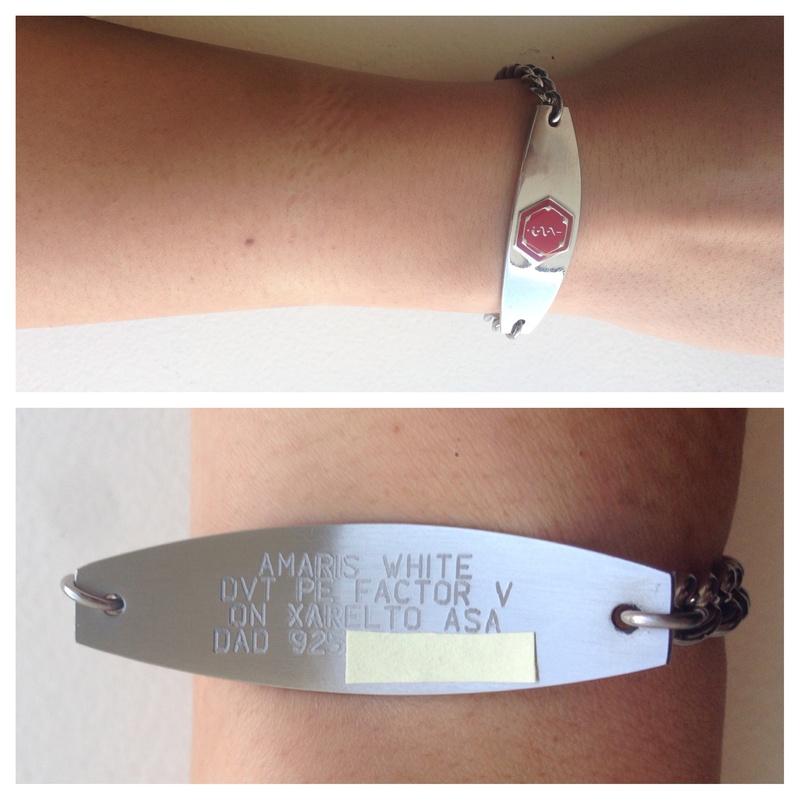 And so I’m sticking to the clunky big metal bracelet with the giant red medical alert notice. It’s not pretty, but in an emergency situation where every second counts, you want it to be easily recognizable. Hopefully (probably) I will never need it. For those of you who are also on blood thinners, I highly recommend you wear one as well. We’ve already cheated death once, and there’s no reason for us to do it again—better safe than sorry! « 85% of Air Travel DVT Victims are Athletes. I’m surprised they are allowing you to mix anti-coagulation drugs and aspirin. Doctors tell me not to do it due to increased bleeding risk but I wonder if the risk is exaggerated. Seems like a low dosage wouldn’t increase the risk of bleeding too much. Anti-inflammatories like Aspirin are the only thing that helps with the inflammation from running. With such a serious leg injury as yours, I would strongly consider long term anti-coagulation. Tom–it’s definitely on the more aggressive side, but my current doctor was initially very concerned about the clots in my leg and pelvis worsening. Since my previous doctors were never able to get rid of most of the clot (it’s now leftover permanent scar tissue), the circulation in my leg and pelvis are pretty bad. Preventing new clots is first priority. From what I understand, it’s probably not a good idea to give a double treatment to an elderly person or a less active individual, but because I’m otherwise mostly healthy, he was more concerned with re-clotting as opposed to uncontrolled bleeding. I’ve also been allowed to take other NSAIDs post-surgery like ibuprofen and prescription meds to help with pain/swelling, so I don’t think he’s too concerned (well, as long as I don’t get into some sort of traumatic accident). But agreed–I imagine I will be on some form of anti-coagulation for the rest of my life. My doctor has told me that my running has made my recovery exceed his expectations, so my hope is that the signs of post-thrombotic syndrome and the likelihood of clotting again will go down with each year! Are you on long term anti-coagulation? What is your experience with different meds and did you ever reclot under any of them? Exercise is definitely important after something this traumatic, not just physically but mentally. Your story reinforces what I have always believed. It’s amazing that you are going to run a marathon soon. I’ve been on Warfarin since last October. No new clots during that time. There have been very few issues with drug, for me, other than some indigestion and slow muscle recovery. Getting monthly blood work hasn’t been a big deal, it’s cheap and staying in the therapeutic range has been easy. In all likelyhood I will stay on Warfarin for life. I had unprovoked extensive bilateral PE with lung infarction. If it had just been a DVT, I would feel comfortable stopping Warfarin. But the statistics say there is a 30% chance of recurrence within 5 years of stopping therapy for unproked PE and the next event will likely be another PE. I don’t want to damage my lungs anymore than I already have and there are some scary conditions out there like pulmonary hypertension that you dont want. I do believe endurance exercise probably played a role in my PE along with genetics. The inflammation, my low resting pulse of 32, dehydration etc. A few people in my family have clotted before but I tested negative for all known genetic disorders. I went to a lecture about clotting yesterday, at the hospital I work at, and I was surprised how much they don’t know. Some of the genetic clotting disorders were discovered fairly recently (1990s). I hope they continue making discoveries and prevent this from happening to more people. Also wish there would be more studies on endurance sports and clotting as well. Wow, that’s so scary, not having any other risk factors for the bilateral PE. Although there is definitely a part of me that is scared I will get in an accident and bleed to death, I’m also much more worried about having another clotting incident. I had bilateral PEs as well, but was lucky that the clots were small and did not damage my lungs (at least I think? I never had any chest pain, the PEs showed up on the scans though). I’m glad to hear you’re still staying active though. I think that’s very very important! I was so depressed when I was in the hospital and in a wheelchair, running really does make me feel so much better and accomplished. The decision to stay on anti-coagulation is difficult. An expert who spoke at my hospital last week said she doesn’t know how to advise people. Sometimes she tells them to stay on the thinners but then one of her patients will have a bleeding event and she starts encouraging people to go off the drugs. There are probably a lot of disorders that hopefully will be discovered. I obviously have a genetic component since two relatives clotted but we all tested negative for known disorders. Similar to your story, I was upset that I didn’t realize how serious my illness was and I allowed myself get some lung damage. It took me about 2 weeks to realize what was happening and I was stuck in a cycle of improving and then getting worse. Not having DVT symptoms before the emboli also confused me. I am familiar with blood clots since I work in a pathology lab and embolism is a cause of death frequently. Donate to help #StopTheClot and #fightDVT!!! What I wish I’d known. A year ago I almost died.